" To the inhabitants of the district of Grand Pré, Minas, River Canard and places adjacent, as well ancients as young men and lads. Whereas His Excellency the Governor has instructed us of his late resolution respecting the matter propsed to the inhabitants, and has ordered us to communicate the same in person, His Excellency being desirous that each of the should be satisfied of His Majesty's intentions, which he has also ordered us to communicate to you, as these presents, all of the inhabitants as well as of the above-named districts as of all the other districts, both old and young men, as well as the lads of ten years of age, to attend the church at Grand Pre, on Friday, the 5th. instant, at three in the afternoon, that we may impart to them what we are ordered to communicate to them, declaring that no excuse will be admitted on any pretense whatsoever, on pain of forfeiting goods and chattles, in default of real estate." "That your Land & Tennements, Cattle of all Kinds and Livestocks of all Sorts are forfeited to the Crown with all other your effects Savings your money and Household Goods, and you yourselves to be removed from this Province. "Thus it is Preremtorily his Majesty's orders That the whole French Inhabitants of these Districts be removed, and I am Through his Majesty's Goodness Directed to allow you Liberty to Carry of your money and Household Goods as Many as you Can without Discommoding the Vessels you Go in. I shall do Every thing in my Power that all those Goods be Secured to you and that you are not Molested in Carrying of them off, and also that whole Families Shall go in the Same Vessel, and make this remove, which I am Sensable must give you a great Deal of Trouble, as Easy as his Majesty's Sevice will admit, and hope that in what Ever part of the world you may Fall you may be Faithful Subjects, a reasonable & happy People. "I Must also Inform you That it is His Majesty's Pleasure that you remain in Security under the Inspection & Direction of the Troops that I have the Honr. to Command." They were then declared to be prisoners of the King. This was just the beginning of great suffering for the Acadians. The British would pursue and deport any and all Acadians they could find for the next 11 years. This was not a one-time happening. Many of our ancestors died on the ships at sea and suffered great harships in the lands to which they were exiled. For forty years, that is, from 1700 to 1740 the Acadians pretty much ignored changes taking place in North America while the tensions were increasing between the French and the English as they battled for control of the continent. Even after the British conquest of Nova Scotia in 1710, the Acadians who had managed to remain neutral, pretty much went on with life as usual and with narry an interruption from the life they knew. France never really lent a great deal of help nor support to the Acadians. Again in 1713, when the war between the English and the French officially ended, one more time, France sacrificed Acadia and its population when the Treaty of Utrecht was signed. Control of Acadia and Newfoundland was given to the English while France retained control of only Ile-Royale/Cape Breton Island and Ile Saint-Jean/Prince Edward Island. Nova Scotia was the new name given this land formerly known as Acadia and Port-Royal would become Annapolis Royal, renamed so in honor of Queen Anne of England. 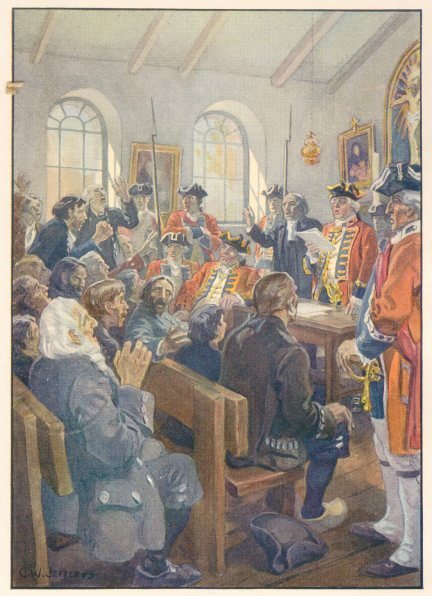 Between 1719 through 1730, the Acadians had taken oaths of loyalty to the British throne which had given them a verbal assurance of neutrality and included the promise not to have to bear arms against the French - their countrymen - and the Micmaw. Though likely supported and intervened by the French priests, the neutrality the Acadians adhered to was likely of their own doing. The British referred to the Acadians as the "Neutral French" or as "the Neutrals" and they were spoken of or referred to in this manner even in the American colonies. In 1755,this position of total neutrality in the face of great British adversaries who disliked them, and who would do anything to win the English view in this matter, would lead to the demise of the Acadians. Within the next few years there was a significant change in the position of the Acadians. Because of their neutrality, neither the English nor the French now trusted the Acadians. The time came when the Acadians were faced with having to choose one side or the other. The British population grew between 1749 through 1755. This created quite a bit of tension for the Acadians. In fact, tensions ran so high on both sides that the English built one fort after another so as to counteract the French presence in Nova Scotia. It was an outward attempt to flex their muscles as the dominant and only landlord of this land! The English worked hard to outdo the French. Because of its location, the English wanted Nova Scotia to be theirs. From here, the Acadians could easily connect with their French counterparts in Québec and the rich fishing banks were easily accessible. The Governor of Massachusetts, William Shirley, knew that this area was the only direct link to Québec by sea and it would also be the link to take the English ships from Massachusetts to the Louisbourg Fortress on Ile Royale/Cape Breton Island.